BROWN, BOB - Brave and the Bold #78 pg 1, splash. 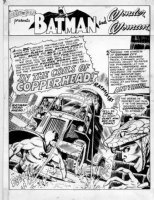 First appearance of Copperhead, PLUS Batgirl and Wonder Woman fight over Batman! BROWN, BOB - Doom Patrol #99 lrg pg 3, main heroes: Robotman vs Negative Man as Elasti-Girl breaks them up! 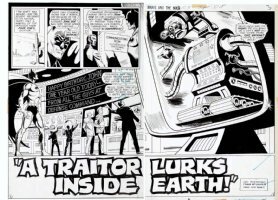 BROWN, BOB - Doom Patrol #99 pg 1, large-size splash - earliest DP splash? 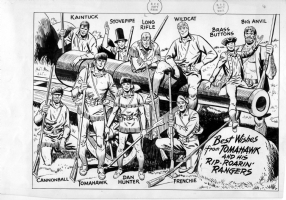 BROWN, BOB - Tomahawk pinup. Incredible shot of the entire cast of the famous Silver-Age DC frontier hero!